Gedder had only just returned from a few days at Tekapo and was bubbling with bravado and confidence. 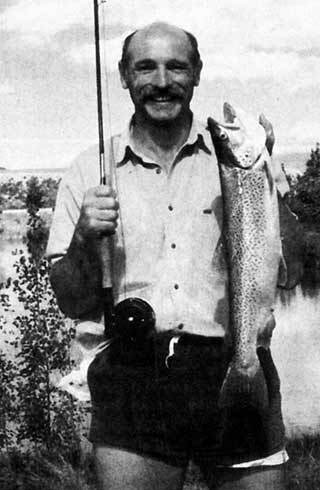 Laid out like a salmon on a silver salver was a rainbow trout of about four-pounds, no great shakes in the condition factor department, but undeniably a rainbow trout. Ged was bouncing on the balls of his tiny feet with unchecked enthusiasm. He was attempting to use the fishy evidence as supportive of some inane theory he had just this minute developed, that spinners had superiority over fly-fishers. Gedder’s angling history needs to be laid bare before I continue the sad story of the rainbow slab. I played a role in encouraging Gedder to try his hand at trout fishing and was present when he landed his first brown and his first rainbow trout. The only reason I saw the brown landed was the unmistakable ﬂash as it was hauled skywards in a high arc to land with a small slap on the gravel bank at the mouth of the Tekapo River. 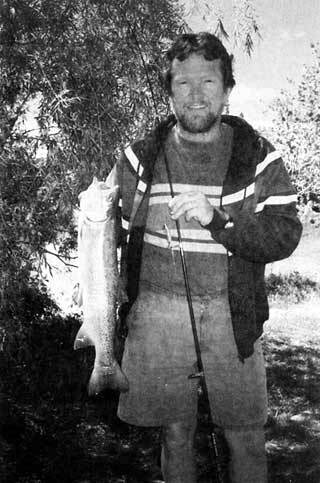 He hadn’t progressed a lot since then, a further small brown dragged from the depths of the Arnold River being his only notable conquest since. for purists who dared decry his methods. He was prepared to accept that in a lot of situations the ﬂy could often deliver the trout where the spinner sent them ﬂeeing. However, he was not backward in coming forward when his rare conquests showed his method did deliver, a rivalry of the method without fervour, but a rivalry nonetheless. I had refrained as long as was decent from asking his story of the capture, knowing that this was the very opening he was itching for. There was a note of scoffing entering his voice as he moved towards the climax. ”Well, he stalked this cagey old trout for two days and couldn’t get a look in. It was the last day of our trip and we both stood watching this cunning trout avoid all these clever ambushes. Hugh cranked his ﬂy line in and had obviously met his match. This was no ordinary trout, it was a wily master that needed some subtlety, a spin fisher’s touch. As he turned to the car I asked nicely if I might have a wee ﬂick at it with my spinning rod. Hugh reckoned I might as well as he was sure it had never had a great big Tassie Devil hurled at it before. So I gave the spinning rod a big heave and sent the Tassie tumbling straight at its head with a big splash. It must have been waiting for this all its life because it never hesitated. It slammed the spinner and its take was so strong as the rod bucked in my hand that it felt like getting the strap at school. Hugh Flaus and a good brown taken by the “ambush” method. Gedder was warming to his story and his little eyes had a piggish gleam of victory shining brightly. As proud as he was, I hesitated to deﬂate his ego by an adverse comment on its condition, so simply expressed minor doubt that it was the full nine pounds, as he claimed. It was duly smoked and garnished for presentation. I must admit that it did look a little bigger than a small rake handle when split and covered in herbs and fresh chives. Gedder later accused me of passing disparaging information to Peter Shutt, who entirely coincidentally referred to the current poor condition of the trout from Paterson Lake in a newspaper article the week following. I haven’t spoken to Hugh yet to get his version of events, but I can accept the method of capture. Often fishing is like this. The most ludicrous and unexpected lure can deliver where the finest presentation of a well-chosen and delicate nymph is ignored. There can be no rhyme nor reason sometimes, and this is what makes it the challenging past-time it is, unpredictable and defying of the rules. It also allows for the telling of tall stores, garnished with a dash of truth – Tekapo River Spin Fishing.